One of the best ways to experience Virginia is through food. Virginia is, after all, the Birthplace of American Cuisine and the Oyster Capital of the East Coast. Experience Virginia with the flavors of thoughtfully selected, carefully sourced local ingredients. Taste the history of Virginia including sustainable farmed Chesapeake Bay oysters and crab. The food experience on this tour is rooted in more than just good taste: it provides the story of the land you're standing on. Today we travel south to Virginia Beach, Virginia where we check-in to our hotel. Later we will meet our guide for a welcome to Virginia Beach Riding Tour as you learn about the history of Virginia's largest city and get the pulse on current day in Virginia Beach. Dinner this evening will be a fun, casual meal at Rockafeller's which features fresh, local seafood and American favorites in a beautiful setting on Rudee Inlet. Boat cruise, where we will witness close-up observations of our marine environment and its inhabitants as they glide through the waters of the Atlantic Ocean. Enjoy lunch on your own in the VIBE district, offering a variety of eateries in this art-focused neighborhood. Then we venture to Smartmouth Brewery to quench our thirst with a craft beer tasting. 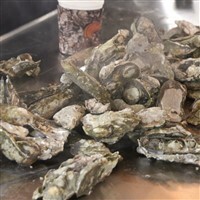 This evening, you'll taste oysters at Bubba's Seafood Restaurant, a local laid-back hangout with a rustic vibe, on the water. Following breakfast and check-out, we visit The Virginia Beach Surf & Rescue Museum, a former life-saving station from 1903, which houses exhibits dedicated to preserving our maritime heritage. Later we depart for home with fond memories of our time spent exploring Coastal Virginia's oyster trail. Arrival home is scheduled for later this evening.